Anne Haworth lectures at the Victoria and Albert Museum, and the British Museum. She is a Guide for private tours of the State Rooms and the Queen’s Gallery at Buckingham Palace. 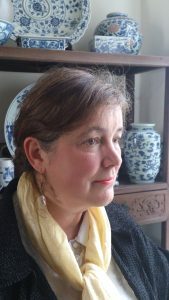 In Autumn 2002, she catalogued the collection of Chinese Porcelain at Kensington Palace; and in 2002- 2005 was a committee member of the French Porcelain Society. In 1995 – 2002, she became a resident of Shanghai, China. 1981- 1995, she was a ceramics specialist at Christies and Bonham’s head offices.Chinese porcelain. The lecture was an introduction to Chinese art, including paintings, calligraphy porcelain and jade, viewed through the eyes of the gentlemen connoisseurs known as literati. It considers how the natural world, gardens, poetry and ancient philosophies, myths and legends have all influenced the development of Chinese art. Anne worked closely with us in planning her lecture to fit in with a Fylde DFAS visit in October to the Manchester Museum for an exhibition about China. This is a British Museum Tour, supported by BP, a CHINA NOW Project, opening in September 2010 until June 2011.